Many founders begin with an idea for an offering they think people want, often spending months, or even years, developing a product or service without showing it to users or customers. When their offering fails in the market, it happens because the startups never spoke with customers to determine if their product was needed. The first step is figuring out the problem that needs to be solved, and then developing a Minimum Viable Product (MVP) to accelerate the process of learning. This guide will cover everything you need to know about how to develop an MVP, iterate on it and learn as fast as possible. Your most precious resource is time. To maximize your time, you must focus on areas that yield the most return on your investment. Similarly, working on the wrong details of your startup for too long can lead to your company’s death. You might be doing this because you’re looking to solve a specific problem for yourself or for others. Perhaps you believe people need a new way of doing things. Either way, you need to have a clear understanding of what your company’s purpose is before you set out to validate your assumptions about your business. If you need help defining your startup’s vision and purpose, Des Traynor’s Intercom article, “Why Startups Need a Strong Vision”, is a great place to start. We recommend that you complete the business model canvas to understand the needs of your business. Utilize the ‘value proposition’ section in the business model canvas to help you determine what benefits your product offers to your potential customers. We strongly recommend that you do customer development interviews to determine who will benefit from your offering. This process will also help you understand if there is a need for your product or business, if this is a problem that needs to be solved and who your potential customers are. For my product to succeed, _______________ must happen. Divide your assumptions into two groups: Will Kill and Other. 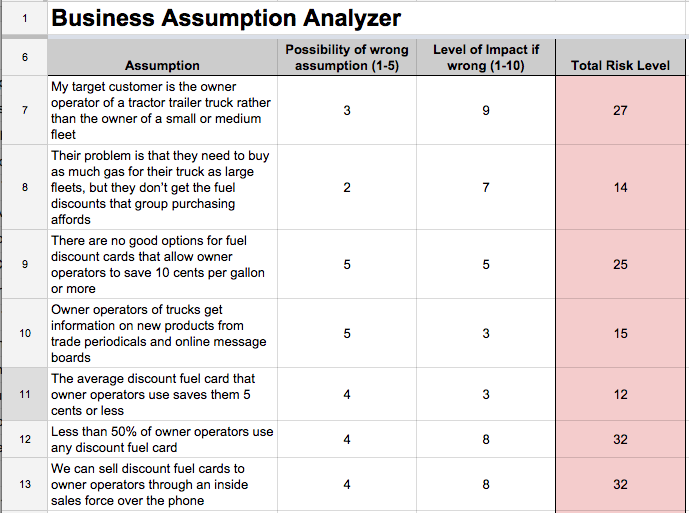 Select the assumptions from Will Kill that must be true in order for your business to succeed, yet they have the highest likelihood of being false. Building something is rarely your riskiest assumption. For more information on finding and eliminating the biggest risks that face your startup, check out our blog post, “3 Steps to Finding the Biggest Risks to Your Startup (and How to Eliminate Them)”. You have nailed down your company vision. 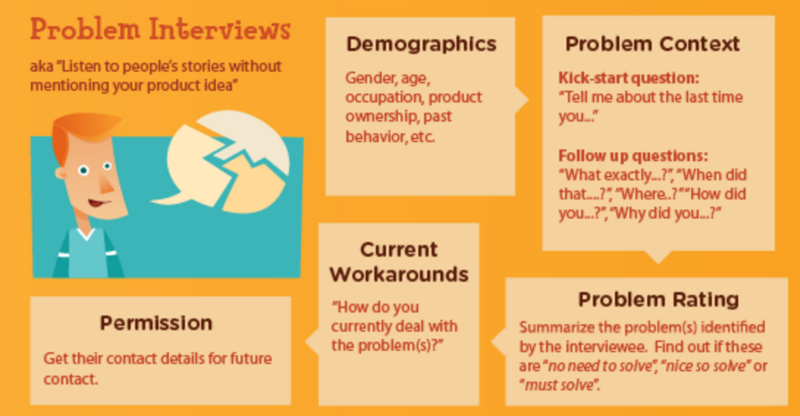 You’ve conducted your customer development interviews and you identified your riskiest business assumptions. It’s now time for you to develop a Minimum Viable Product (MVP). Eric Ries defines a Minimum Viable Product as “[the] version of the product which allows the team to collect the maximum amount of validated learning about customers with the least amount of effort.” Your MVP is a product developed with a minimum set of features that will be enough to validate your riskiest business assumptions. However, keep in mind that an MVP isn’t just something that needs to be built to prove you can build something. In The Macro article, “A Minimum Viable Product Is Not a Product, It’s a Process”, Yevgeniy (Jim) Brikman expounds on what founders get wrong about the idea of an MVP, stressing the fact that it is something more than just a “lite” version of your finished offering. Explainer Video - Dropbox created a demo video and got 5000 subscribers for their product prior to launch. Landing Page - Craft a landing page. Set-up a Google AdWords & Google Analytics. Measure the % of visitors that sign up. Wizard of Oz - Set up a front that looks like the real product, but do all the work manually. The founder of Zappos would go to local shoe shops, ask the owner for permission to take photos and then he would put them online. He handled payments and deliveries himself by hand. Concierge - Instead of providing a product, start with a manual service. The service should have the same steps a user would take to use your product. The added benefit of this approach is that you accelerate your learning because you’re forced to talk with your customers. Single Feature - Google started out with a single feature: search box. If you can’t find one killer feature that can stand on it’s own with early users for your product it’s likely the product is not a must have. Piecemeal - In its early stages, Groupon was a combination of WordPress, Apple Mail, and AppleScript that generated PDFs manually as orders were received on the website. Digital Prototypes - Apple regularly creates interactive mockups for their software products in Keynote. You can also use tools like Invision to create prototypes. Pre-order Pages - Oculus Rift launched a pre order campaign on Kickstarter. This showed how much demand there was for their product leading to an eventual Facebook acquisition. For more MVP ideas, go here. It’s critical that you set conversion goals that validate your riskiest assumptions. You are not seeking supporting evidence for your solution. Instead, you need to find out if this is the right solution. Also called A/B testing, is the process of comparing two versions of a website, app, software or other product against each other to determine which one performs better. The goal is to improve your offering’s various metrics, like clicks, form completions, and purchases. Don’t just track the total number of pageviews - track more specific data, like the number of pageviews per new and returning customer. Monitor where and how your audience is coming to your website to make ROI-based decisions on where to invest your time in getting the most traffic. Tracking keyword rankings is important to determine your search engine authority and enables you to measure the keywords you want to rank for. If your keyword rankings don’t increase over time, you may be targeting the wrong keywords or you aren’t building your brand’s reputation. According to Wikipedia, validated learning is a process by which one learns by trying out an initial idea and then measuring it to validate the effect. Each test of an idea is a single iteration in a larger process of many iterations whereby something is learnt and then applied to succeeding tests. At this phase in your company’s life, most aggregate measures of success, like total revenue or total users, are not are not at all useful because they don’t tell us the key things we need to know about our business such as: what is the total addressable market; what is our return on investment for acquiring a customer; how do customers respond to our product over time etc… This approach prevents your team from measuring progress by the number of products you’ve built or by your product development roadmap. However, learning is difficult to quantify. Validation comes in the form of data that demonstrates that the riskiest assumptions in the business have been addressed by the current product or solution. The data must demonstrate that the business is financially solid. Learning is a crucial part of building your first product, and it’s something that you will have to repeat numerous times. Just ask Steve Blank, who goes into detail of the Build-Measure-Learn process in his article, “Why Build, Measure, Learn – isn’t just throwing things against the wall to see if they work – the Minimal Viable Product”. The “Build’ step refers to building a Minimal Valuable Product. Each time you build an MVP you define what you are trying to test. The ‘Measure’ step refers to the process of measuring the results of your test. In the ‘Learn’ step, the results from the ‘Measure’ step are used to validate what you were testing with your MVP. The ‘Learn’ phase helps you determine what hypothesis to test next. All your startup processes should be designed to accelerate the Build - Measure - Learn Feedback Loop. The goal of the loop is not to get data, but to get insight and inform your vision. Once you’ve built your first product and have begun tracking its development, remember that this is only one step toward building a product that people will (hopefully) love. However, the best products weren’t created overnight, nor are they result of a whim. Rather, the best products are refined, reformed, and rebuilt until they’re ready for an unsuspecting public. Now get out there and build something great! If you need help building a meaningful product, the Founder Institute can help you. Click here to join a program in your city!